FRIDAY — What is Your Rhythm of Life? 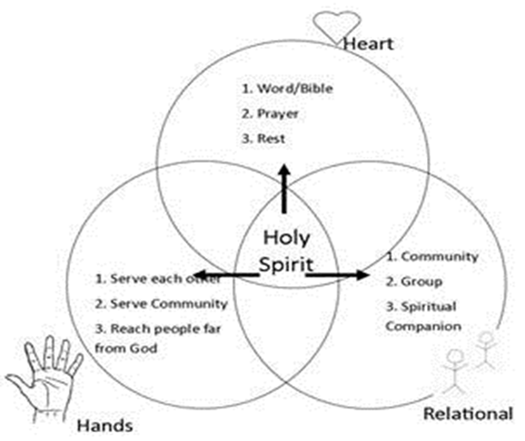 Big Point: By developing a rhythm of life, you can effectively engage in the spiritual disciplines and live a life that allows you to be available to the Holy Spirit’s guidance. “A ‘Rule of Life’ is an intentional pattern of spiritual disciplines that provides structure and direction for growth in holiness. A Rule establishes a rhythm for life in which is helpful for being formed by the Spirit, a rhythm that reflects a love for God and respect for how He has made us. The disciplines which we build into our rhythm of life help us to shed the “old self” and allow our “new self” in Christ to be formed. Spiritual disciplines are means of grace by which God can nourish us. Ultimately a Rule should help you to love God more, so if it becomes a legalistic way of earning points with God or impressing others, it should be scrapped. If the traditional, ancient term “rule” concerns you because it sounds legalistic, think of “rule” as a “rhythm of life” or as a “Curriculum in Christlikeness” (Dallas Willard), or as a “Game Plan for Morphing” (John Ortberg). Provide a clear self-assessment that briefly describes your current situation in life–family responsibilities, work schedule and other life circumstances. What are the strengths and weaknesses of your character? Are you blessed, for example, with self-control, a compassionate heart, a bright mind, or a spirit of joy? Which vices do you most struggle with? Describe the way in which you practice specific disciplines (how and when to pray, serve, practice simplicity). How do these disciplines address the areas where you need discipline and growth? Where do you sense that God is calling you to stretch and grow? Where do you want to change? If you could hear your own eulogy, what would you want to hear? PRAY…God, what do you want me to know and do? Ask God to help you take the time to develop your “rhythm of life” and to always be open to the prompting of the Holy Spirit. Who will you invite to our next series? “FIGHT!” Starting the weekend of May 26th, a new series will begin that addresses how to fight for your country, your faith, your marriage, your soul and how to fight your fears. We encourage you to invite someone to this series of messages. Ready to commit to Missional Membership? If you completed your Missional Membership study (either online, by completing the Missional Membership workbook or through the LifeGroup DVD), feel free to attend any one of the Commitment Day sessions during all four services this weekend. Are You Interested in Joining a Ministry? Become an Intern. The CedarCreek internship program is a year long opportunity that allows individuals to get personal ministry experience and grow in their faith. Send an email to Wade at wades@cedarcreek.tv for more information.